EyeTrackShop data has revealed that the Facebook Page Post Ad format attracts 92% of the users’ gaze. The figure is 200% higher in terms of visibility when compared to the Facebook Standard advertising hoard. 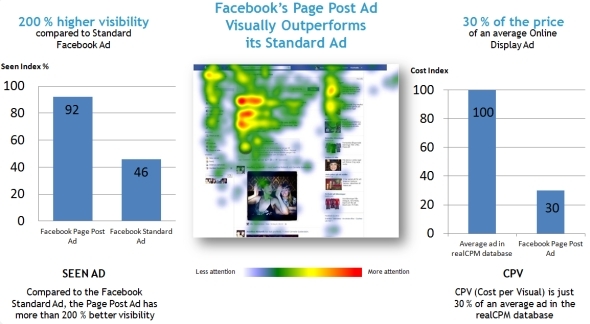 The eye-tracking company discovered that 50% of all online ads impressions are never looked at. EyeTrackShop utilises users’ regular webcams to track gaze patterns on Facebook pages and volunteers took the studies without knowing the subject of the test. Mindshare Account Director, Anthony Jones, believes Page Post ads are an all-round better proposition for marketers. “The central Newsfeed is where the action is on Facebook and advertisers are able to display more engaging and bigger ad units to the Facebook audience,” he said. In one of EyeTrackShop’s studies, pricing was compared to the visual performance. The Facebook Page Post ad had a significantly lower CPV than the average online display ad. It means the cost of a Facebook Page Post ad is only 30% of the average online display ad. Facebook is under pressure from shareholders to improve its monetisation options for advertisers. The launch of the Page Post ad format last year is likely to help the social network appease its financial backers, which EyeTrackShop UK MD, Darren Hamer agrees with. “The study we conducted on the Facebook advertising formats showed that despite all the hype and column inches given to the site since and after its IPO it has a real value to potential advertisers,” he said. This will be discussed at Performance Marketing Insights NYC, March 12-13. Find out more.